2014 is coming to a close, and with that comes New Year’s celebration around the world to ring in 2015, and make or revisit resolutions for the New Year. New York City’s annual New Year’s Eve Ball Drop is one of the most well-known celebrations with an estimated one million revelers cramming into Times Square on December 31. 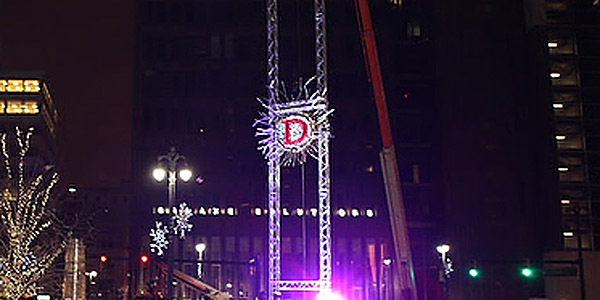 Having a ball drop to countdown to the New Year is not unique to New York City, as many cities and towns across the country have their own version of a ball drop celebration. However, there are some cities that choose to forgo the standard, been-there-done-that ball, and go with something more whimsical that reflects the city and its history, while some places choose head scratching items to drop such as yellow britches, donuts and even live opossums. Here are 10 noteworthy New Year’s Eve celebration around that U.S. that includes the dropping of something or other. Eastport is the easternmost city in the United States, and has the honor of ringing in the New Year twice because of its proximity to the Atlantic time zone. Because of that, the town of Eastport will first drop a giant Maple Leaf complete with a brass band playing O Canada at midnight, Atlantic time (11 p.m. EST). 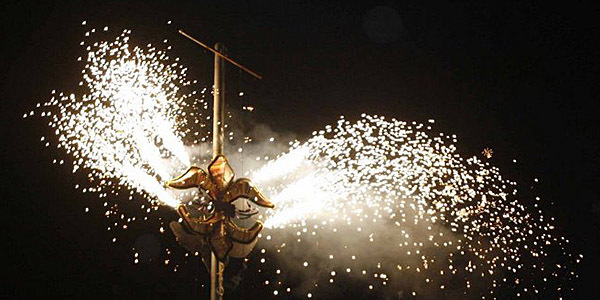 Then an hour later at midnight EST, the town will then drop an 8-foot sardine, accompanied by Auld Lang Syne. And it’s considered good luck to kiss the sardine, which isn’t too bad since it’s actually a scale model. The Old Town of St. George in Bermuda has opted to go with not just an onion, but a Big Onion! Why an onion, you ask? Back in the 1800s, Bermuda was exporting so many onions to the U.S. that the island became known as the “Onion Patch,” and Bermudians became known as onions. Those terms stuck, so hence the onion drop. 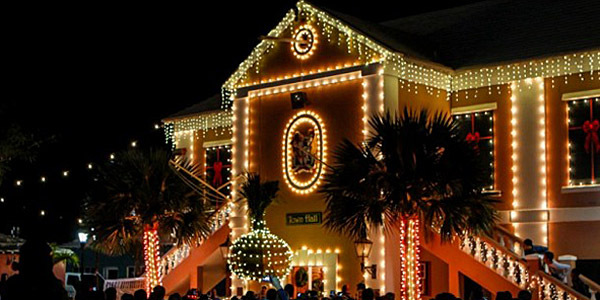 This year’s celebrations will include photographers projecting their art onto some of Bermuda’s oldest buildings, as well as a 15-minute laser show after the onion drop. Partiers at Key West will have not one, not two, but four options to pick from to help them ring in the New Year! 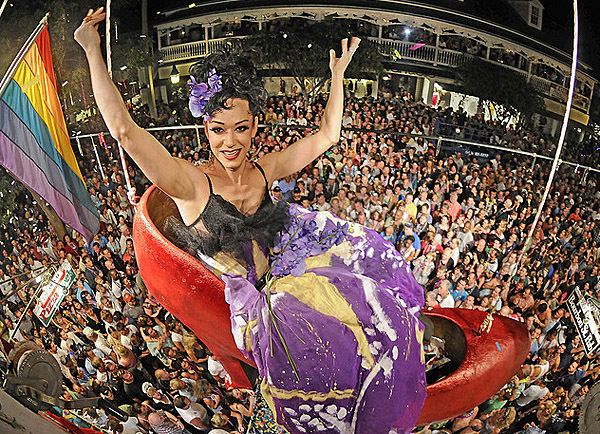 Perhaps the most well-known of the four is Bourbon St. Pub Shoe Drop, dropping an oversized red pump along with Sushi, star of the weekly drag queen review. The shoe has come a long way from the original, 18 years ago, which was made out of chicken wire, paper mache and plywood. A few blocks north is Sloppy Joe’s annual Dropping of the Conch Shell, which has been around since 1993. The idea was the brain child of local artist Tobias McGregor, who wanted to have a more centralized area for people to ring in the New Year. 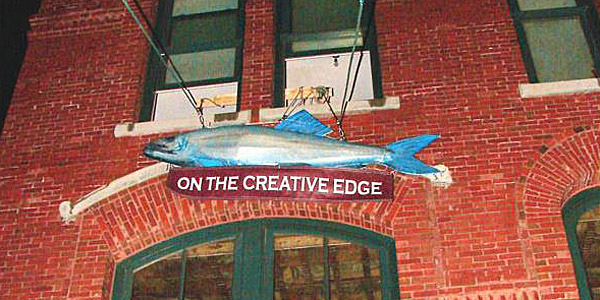 The party starts at 10 p.m. with live entertainment performing on Sloppy Joe’s rooftop for the crowd below. If you have extra to spend, then perhaps Ocean Key Resort & Spa’s New Year’s Eve Burlesque Party is the place for you. For $200 per person, you’ll be treated to a buffet dinner, open bar and live entertainment. And at midnight, replica of a Key lime wedge will be dropped into a giant martini glass. And if you want an excuse to dress up in pirate garb, then Schooner Wharf is the place for you. Called the “Lowering of the Pirate Wench,” instead of dropping an inanimate object, the Schooner Wharf went with the lowering of their own pirate wench, Evalena, from the mast of Schooner America 2.0 at midnight, followed by a dove being released and cannon blast. Billed as the largest free party in South Florida, Miami’s Bayfront Park turns into a huge dance arena on New Year’s Eve. 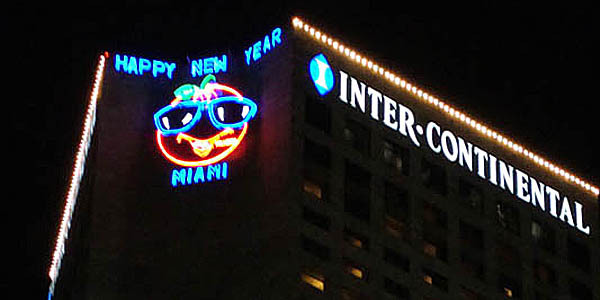 Instead of dropping, their “Big Orange” will rise along the side of the InterContinental Hotel, located on the south end of the park, and reach the top at midnight, setting off a firework display over Biscayne Bay. Georgia is known for producing some of the best peaches, and the official state fruit is the peach, so it goes without saying that Atlanta will be dropping a giant peach – an 800-pound Peach to be exact. 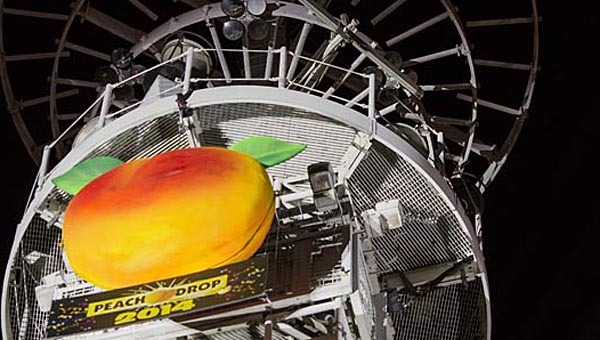 Billed as the “Largest New Year’s Eve Celebration in the Southeast,” Atlanta’s Peach Drop will kick things off at 11 a.m. on New Year’s Eve with live performances, street food, rides and activities for the entire family. A fireworks display will commence after the peach drop, with live music and celebration until 4 a.m.! In the past, this celebration included performances by Janelle Monáe, Morris Day and Miranda Lambert, so you can be sure another superstar will be on stage this year. Maybe Kandi Burruss from The Real Housewives of Atlanta will make a surprise appearance. 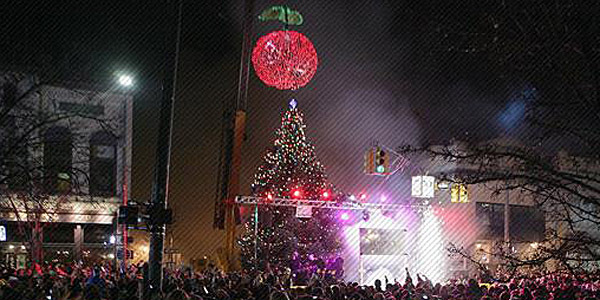 Traverse City’s annual New Year’s Eve celebration is dubbed the CherryT Ball Drop, which is a play on the words charity and the cherry. The charity portion comes from the admission fee: either $3 or three non-perishable food items that will be donated to the local families and charities such as the Goodwill Food Pantry. And a cherry is chosen because 75% of the country’s cherry production comes from the Traverse City region. Local musical acts and a DJ will get the crowd going, and just before midnight, a sparkling cherry will descend 115 feet to ring in the New Year. Known as the Motor City and home to Motown, it would stand to reason that Detroit would reach into its rich history and drop perhaps an automobile built in Detroit or maybe a giant vinyl record. Or with the oil prices dropping, maybe this year it should be several oil barrels? The party starts at 4 p.m. with a DJ and live musical performances until 2 a.m., and there will also be ice skating, fire pits, horse drawn carriage rides and more. New Orleans maintains its reputation as party central by kicking things off at Jackson Square with live music to keep everyone in the celebratory mood until midnight, when the fleur-de-lis (a stylized lily and the symbol on the city’s flag and professional sports teams such as The New Orleans Saints) is dropped from the top of Jax Brewery, which is a couple of blocks away. This is followed by a 15-minute fireworks display over the Mississippi River. This is just the beginning of the this party, as the celebration then moves over to the bars and clubs along Bourbon Street and Frenchmen Street, keeping the partying going all night long. Gavin DeGraw and Lady Antebellum will headline the Nashville’s 6th annual Bash on Broadway, when the Music City drops a 15-foot-tall music note from a 125-foot structure followed by a fireworks show that the city “promises to be the biggest and best ever.” Nashville’s New Year’s Eve celebration actually starts on Sunday, December 28, and continues for the next five days with sporting and musical events, including the Franklin American Mortgage Music City Bowl that pits Louisiana State University against the University of Notre Dame. 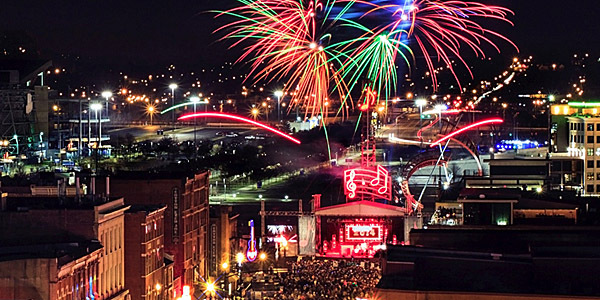 If that’s not enough, the city’s visitors and convention bureau came up with 99 reasons why you should be ringing in 2015 in Nashville. 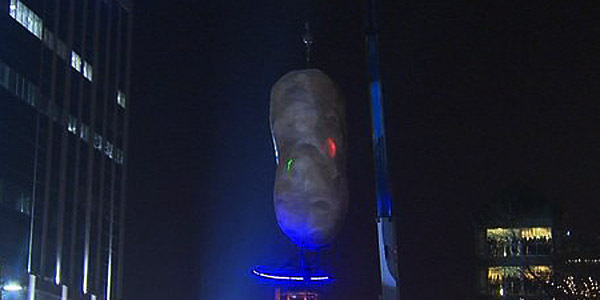 To commemorate Idaho’s 150th birthday in 2013, Boise staged a New Year’s Eve celebration with its Potato Drop, ringing in the New Year with a 17 foot long potato at midnight and filled the streets with live music, food trucks, street performers and carnival rides. The organizers promised that this year’s celebration will top last year’s with double the space for partygoers to dance the night away. And you can feel good about celebrating, as a portion of proceeds will be donated to the Boise Rock School Scholarship fund. A convenience store in this tiny, mountain town drops live opossums in a Plexiglas box for ring in the New Year. People for the Ethical Treatment of Animals (PETA) has been challenging the event, and it looks like they may get their wish granted this year.